Height: 7'9"; this is the total length, not the height of the post out of the ground after installation. Includes Plastic Ladder Rest with your choice of black or gold plastic balls; optional powder coated Steel Ladder Rest* (with plastic balls) is available at additional cost. If no ladder rest is specified, a Black Plastic Ladder Rest with Gold Plastic Ornamental Balls (LR1GB) will be included. 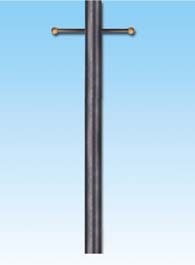 A 10' steel post is also available but requires shipping by Freight, please call for pricing and shipping information.